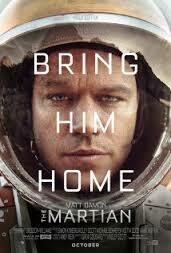 Review: During a mission to Mars, astronaut Mark Watney is left stranded by his crew and presumed dead after a fierce storm. He does everything he can to survive with only meager supplies. While out on Mars he tries to find a way to signal to earth that he is alive. The whole world comes together to root for Watney’s safe return. I was slightly worried that this was going to be too much like Interstellar as it was a similar story and both starred Matt Damon and Jessica Chastain. Based on a novel by Andy Weir. A few interesting facts that I have learnt about Mars is that there day is a few minutes longer (about 40mins) than Earth’s and one year is nearly two Earth years. Great to see Ridley Scott direct such a fantastic film (unlike some of his other more recent work). Very tense and gripping. You never knew what was going to happen until the very end. You actually cared and believed in Matt Damon’s character. He was very charming in this film. There were several times where I laughed out loud. As well as this being so well directed it has also been well written. This film also reminded me of the film Cast Away as it was about survival. Other films that are similar to this are Moon and Gravity. At the Golden Globe Awards in 2016 this won 2 awards and they were for Best Motion Picture – Musical or Comedy and Best Performance by an Actor in a Motion Picture – Musical or Comedy (Matt Damon).